My art practice is based on the premise that art produces arguments for the viewer. I started my art career as a painter, but two years ago, I abandoned painting to concentrate on media-based art. Nowadays, I do primarily videos, video installations and short films. The main topics I deal with are of a political nature. This is sometimes attributed to the fact that I am of Iraqi origin, but I believe we truly live in political times, regardless of geographical position, and art cannot thrive outside its social context. 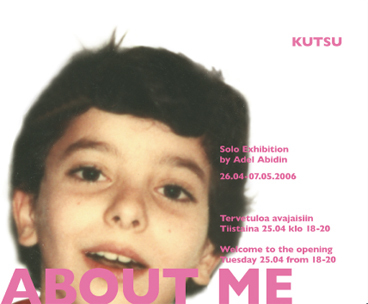 In my solo exhibition ABOUT ME at Huuto Gallery, I present four video installations and a video work. A travel agency promotes vacation trips to Baghdad, showing the life that Iraqis are living at this very moment in Iraq, while the spectators in the gallery sip their glass of wine. COLD INTERROGATION is a video installation dealing with the dilemma of being an Arab, Muslim, and Iraqi individual living in a western society in this period of time. Since I left my home country Iraq in 2000, I dealing with different questions about my identity every day. In the beginning of my sojourn, I was happy to answer those questions, and satisfied with the answers. But during the past two years, these questions have started to take the shape of an interrogation. Am I nothing more than a representative of Saddam Hussein, George W. Bush or Osama bin Ladin? COLD INTERROGATION creates an interactive atmosphere, by inviting the viewer to take part in the interrogation. The piece consists of a refrigerator (my personal one), a monitor, a DVD player, and a door eye. The monitor and the DVD player are situated in a large-sized refrigerator. The viewer can listen to the loud audio of the questions coming from inside the fridge, and see the video through a door eye fixed on the fridge door. Performed by: Dr. Mika Hannula. Since I was a child I loved singing, and always thought that I have a good voice, but that was not encouraged in my family since they all thought my voice was in fact ugly. Then I started singing in the shower – alone. When I came to Finland and tried to learn the Finnish language, I found it challenging, but wondered whether it would be easier to sing, since it seemed to have its own rhythm. Two days before the opening of this exhibition, I sat down, gathered all my courage, and composed this song. So, here I am, sharing it with you. This should be a fun experience, especially since this is the first time I ever play the guitar. I hate the winter in Finland. That’s it..